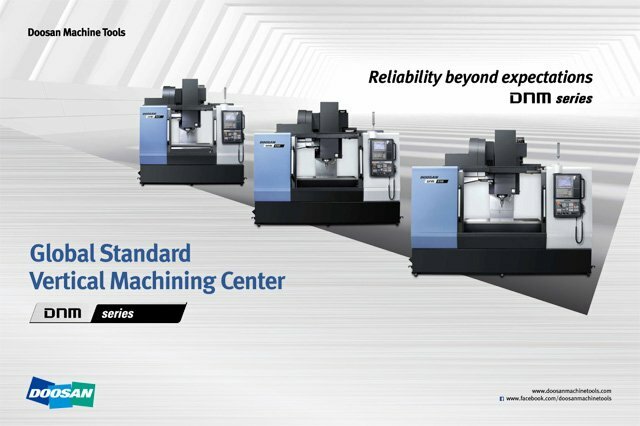 Doosan machine has launched its new DNM Series of maching centers (DNM 4500, 5700, 6700), enhanced versions of its global bestselling DNM II Series that are designed to machine parts with even higher productivity and accuracy. By applying the concept of Reliability Beyond Expectations, DI’s new DNM Series realizes greater productivity, operator convenience, and eco-friendliness, exceeding yet again the users' expectations. The New DNM Series offers larger cutting space, table size and maximum load while maintaining the same footprint as the previous DNM II Series, as well as a faster tool change time for improved productivity. The New DNM Series is equipped with direct-coupled type spindles (8000 / 12000 rpm, 18.5/11 kW) – and a thermal error compensation system, which are essential for stable machining, as standard features. Furthermore, the lubrication of the axis travel system has been changed from oil to grease type, greatly reducing maintenance costs and improving the work environment. The New DNM Series offers a cutting space 6% larger than that of previous models, with increased X and Y travel distance, for the same machine footprint. Table size has been enlarged by 14% to facilitate the processing of larger work pieces with more complex shapes and more space for additional rotary table, while the maximum table load has been increased by 25% to accept heavier workpieces. Increased spindle power and torque compared to the previous models boast maximized cutting capacity. In addition, the direct drive spindle provides improved acc/dec rates which reduce spindle start/stop time and improves the productivity of rigid tapping. The New DNM Series adopts the direct-coupled type spindle (8000 r/min, 18.5/11 kW) in place of the belt-driven type as a standard feature, greatly reducing vibration and noise from the spindle during high-speed operation. Tool change time is reduced by 14% compared to the previous models and idling time is further reduced with improved spindle and feed shaft acceleration and deceleration performance. Direct-coupled spindles can also reduce thermal displacement by about 40%, enabling more stable machining. In addition, Doosan's unique themal error control system substantially reduces the influence of heat on machining accuracy. Unlike previous models which used slideway oil, the New DNM Series employs the grease lubrication system, improving work environment and reducing the annual maintenance cost by 55%. Dispensing with the inconvenience of oiling the machine every three days, users only need to grease it once every three months. In addition, since the slideway oil does not mix with the coolant, no oil skimmer is required and no unpleasant odors are generated. The New DNM Series features the Auto Recovety function, thus resolving the problem of Changer Arm stoppage during operation and enhancing the operator's convenience. In addition, E.O.P (Easy Operation Package) function can be observed through pop-up windows and Multi Machine Monitor function is provided as standard to maximize operator's convenience.